It's not everyone's favorite episode but personally, I love it. As Godfrey says ... Boom! Boom! Yes, overall, a good late Terry episode and another appearance for Big Stan. And Arthur buying the vicars knocked off telly!! Chisholm getting nicked and hoiked off in the garden! lol!! Many good bits. Just let down (for me) on occasion by Terry's sometimes poor attitude (especially at the quarry collecting rocks etc). "The Occult Terry, the Occult"
Happy New Year to you lot! It is always like coming home when being among you lovely fans! Cheers! Recently I noticed Sylvia Kay ( Mrs. Hurst on Minder ) on television - it must have been one of those Armchair Cinema episodes- can't remember, but I instantly noticed her! Norman Tebbit? :-o Actually, I find Chisholm to be too comic in the later episodes. I like him best when he's more deeply cynical, if you know what I mean. That said, I think he is easily the best thing about Daley's Bread, an episode where I found the gang of misfit thieves to be generally unfunny. His facial expressions in that one are priceless. Although there isn't that much going on in this one, I think some great dialogue throughout the episode makes up for it. Mrs Hurst: "What does 'as seen' mean?" Arthur: "Thats just legal jargon. Means you've seen the car your buying!" Chisholm to DC Jones: "One of these days your going to have to make your mind up Jones whether your a Welshman or a Policeman!" Arthur & Terry mimicking Godfrey at the end of the episode - "Bla Bla, Bla, Bla Bla, Boom Boom!" One of the best lines ever in Minder in my opinion! Love it. Gave this a watch today, not a bad episode just feels a little disjointed at places, but held together by some decent acting. Some cracking lines in it. Loved the one where Arthur told Terry he was wanting a TV for the Kitchen as "Er Indoors, is looking for a bit of mental stimulation whilst waiting for the duck a l'orange to defrost". Norman Eshley appeared to be in a few things throughout the 70s and 80s and just fell off the radar. James Booth is a very good character actor and usually adds a touch of quality to whatever he appears in, I thought he played Godfrey well, a very shifty character. Norman Eshley was in 'New Tricks' with DW a few years back and also appeared on TalkingPicturesTV (Sky channel) over Christmas 2015 wishing viewers a Merry Christmas. The bit when Chisholm gets on the swing and nearly goes upside down but tries to hang on grimly to his dignity; perfectly judged by Patrick Malahide. I thought this was a really funny episode, Arthur and Terry always bickering, Arthur having to get the last word, Terry trying to keep it straight. The bunch of cockney villains, desperately hanging on to their lifestyle of petty crime no doubt pleased as punch the vicar is playing a mark without actually realising what's under his nose, and the sheer simplicity of their plans for the great 'rockery' escapades ! Chisholm, with his 'knowledge and expertise' being unable to see thru the Winchester regular at the end who all of a sudden becomes a grass on Arthur, and drives off opening up the way for Arthur to restock the vestry, absolute gold, as we all know people like that, too clever for their own good but gullible to the end! Has anyone seen the Sweeney episode titled "Poppy"? I saw it a few months ago and if I recall correctly, the character played by James Booth also uses a similar "Boom Boom!" catchphrase. I was waiting for a bit of Godfrey-like goofiness but what with it being The Sweeney, I guess he really meant it. Chisholm and Jones in the neighbour's garden was funny! What about the bit where Arthur writes out the cheque to the vicar and the crooked daughter says "you seem to have dated it 1995"! I watched this one early on this week, I thought it was really funny, this whole series (aside the last episode) seemed to up the stakes in terms of laughs. I agree the Jones in the neighbours garden was hilarious. I enjoyed this episode a great deal. It originally aired on my birthday but in 1985 I had yet to hear of Minder here in Pennsylvania. So many great moments throughout the episode. As well as the ones already mentioned I enjoyed Arthur's defense of "his artisans" against Chisholm. The character of Chisholm is especially well written in this episode and Patrick Malahide makes the most of it. I have to agree with statements in the main description of this episode , that this is the point where Minder becomes more of a comedy show - While we still have many good characters, they are much more light hearted now, gone are the days of Terry minding someone who is being threatened by menacing heavies. Godfrey was a funny character, but his over use of his catchphrases, "bla,bla,bla" & "the wossname" became a little irritating by the end of the episode. Chisholm's obsession with nicking Arthur is becoming more frequent. The "obbo" in the back garden was hilarious. He also gets more wound up at Jones' attempts at humour. We see some typical British Leyland build quality with that Metro that Arthur sells Fiona (the mirror falls off & it is supposedly making a horrendous noise)- no wonder she wanted a Golf Convertible! The quarry where the boys go, to pick up the rocks, looks a bit like a location setting from an early 70s Doctor Who - I half expected to see Jon Pertwee & half a dozen daleks in the background. Not a bad show, but we can certainly tell that the "Terry episodes" are now in their twilight years. Start of the "final" series and it's a good one. Excellent guest slots from James Booth and Norman Eshley. Chisholm and Jones are now regulars and I'm sad at the lack of Rycott in this series. Highlight in this episode is Chisholm and Jones getting arrested. I watched Give Us This Day Arthur Daley's Bread, on ITV4, this afternoon, I have always liked this episode, the scene where Chisholm, first sees Arthur's workers, outside Arthur's lock-up, instead of The Four Just Men, they looked more like a collection of Worzel Gummidge's, I always laugh at the scene, where Chisholm and Jones, are arrested - I'm a Police officer, yeah and I'm Margaret Thatcher, some good guest stars in this episode - James Booth, Norman Eshley and Sylvia Kay, also good to see Patsy Smart (who I will always remember best, from Terry and June), in a small role, in this episode. The World is your Lobster! Another good whatsitsname.Plenty of etc etc.Blah blah blah.Boom boom. Take Minder away from the inner-urban grime and boy the show is worse for it...a very silly episode too. I don't think was one of the better ones, but worth watching as there is good parts within. Just watching this as I type, having not seen for a while, I think it has grown on me. So it has upped my opinion since my last above post. This is one of three Terry episodes that I'm not keen on (the other two being 'An Officer & A Car Salesman' and 'Minder On The Orient Express') and was disappointed when I first saw all three. I think for me the main problem as others have pointed out is that it's more of a comedy episode, I've always preferred the more edgier and gritter ones. The idea of Arthur employing some ex cons to work as landscape gardeners on the cheap is a good one but the characters appear as comedy characters rather than ones that you can believe in. Maybe Godfrey and Marion on their own would have been enough, I found Glue and Paper silly and Vincent added nothing to the story. I wasn't keen on the whole church idea and what with the Reverend Redwood, Godfrey and gang and Chisholm and Jones having a large amount of scenes I felt Terry & Arthur didn't get enough screen time. The parts with Terry & Arthur were the best bits. Don't get me wrong I don't think it's awful there's always something to like in every episode. The trick of putting 1995 on the cheque instead of 1985 was also played out in the Series 3 episode 'The Son Also Rises' with Ted Standen putting 1991 instead of 1981 on a cheque, did Andrew Payne steal the idea from Paul Wheeler? The same Albert Wendell as before. 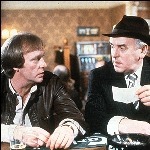 Lots of the great dialogue to be expected in an episode of Minder and a strong showcase for poor old Chisholm. that is a visual ditterence,Terence......Terry. Norman Tebbit? :-o Actually, I find Chisholm to be too comic in the later episodes. I like him best when he's more deeply cynical, if you know what I mean. Both him and Rycott had their rough edges smoothed off and became more comic as the show went on. Rycott in particular was a deeply sinister character when first introduced in The Smaller They Are. David Jackson who was Big Stan in that episode of course plays Marion in this one. To all intents and purposes they are the same character despite their different names. See also George Baker in his two appearances. I also thought the dialogue was great. It was a great build up during the episode, like the ex-cons being employed and the police trying to suggest it was bad news towards the end where Terry prevents trouble. A bit predictable in some spots but it worth it as it was the start of the season anyways.